I would like to apologize for not writing in these last couple of weeks. Deep concerns and uncertainty about the future of my homeland, Venezuela, and everyday concerns and struggling in this new nomadic lifestyle have been keeping me somehow unfocused, troubling my mind and inspiration to get my ideas in order. But now that I am focused, let me talk a bit about nomadic survival and what I “should” have done. Adaptation to a new land has been hard. It would be wise for you to note this about the mind response of someone who believed to be psychologically fit for facing a potential disaster situation, though. I mean, I have been in some lightning fast hazardous events, and responded almost by instinct, and did it pretty well. However, the wear of having to deal with things as they come has been undermining some of my skills. I will eventually adapt, though, but I ask you please to consider this. I know you will, and I appreciate that. I write this after having gone to bed at 7 pm last night and waking at 1:19 AM. They use to say that, as we get older, we need less rest, but I hate that. I like to feel rested. I had a couple of borrowed DVD movies laying around, so watched them on my laptop, and the last one was enough to dissipate some of the clouds in my mind. It was that one where Jude Law and Ed Harris sneak on each other in Stalingrad while looking to make a lead deposit in their respective heads. Of course the situation in Venezuela is not as bloody as that battle was; however, despite the distance, I have been able to feel the desperation and the uncertainty, bad enough to have odd effects on my psyche. Like getting tears out of me when I see someone carrying or dragging their old suitcases closed with a small padlock (something that we Venezuelans use to do when traveling by land, just in case), obviously arriving in this city after days on the road. Not because of the persons themselves. It is because they are the living stream that used to be the flesh and blood of my country. The mother who fried the empanadas for their children before getting them to school is now cleaning bathrooms in some restaurant. The father who used to get in early to his profitable job in some bank now exhibits his hands wounded and sore from having to work at a car workshop, doing all kinds of harsh stuff. There are lots of stories I have heard. More than I would like, indeed. Looking back, it would have been hard to protect ourselves from this. Getting on topic, in retrospect, it would be incredibly hard to protect ourselves from what happened. I know, some of you now will say that we should not have voted for the commies in the first place and that we deserve what they are doing to us. If you did not know it, we had all the legal and constitutional mechanisms to subjugate and control any governor that lost the track. Of course, that would have been possible if the military obeyed our Constitution, and defended it against the foreign invader. But they didn’t, and that will be as much as a shame, a dishonor, as the cause of their defeat. If the commies lost the elections, they would have attempted a coup, or caused a civil war, long enough to take over the power. It was just a matter of time, and now I can see clearly that. Perhaps Uncle Hugo was elected because of the general belief that he would take care of some things, but as I said, the mechanisms to fix things were disrupted by the immoral thugs that now try to control the country. And I mean try, because they don’t. The southern states are now FARC and ELN territory. If someone does not get rid of them, they will start to pour over the rest of the South American countries, and the balkanization of the region will be a fact. That would be great for weapons business, but the entire world would become a gunpowder barrel, generating the basis for a world police state. Don’t think it cannot happen. With the modern technologies, there are a lot of things that surely will surprise some informed minds. I just saw a documentary about robots. One of them, the most advanced, with 21 years of research on its back, could not stand a test walking over debris. But, in the second run, the team guys managed themselves to complete the track, and a million dollars was handed to them. A few months later, an updated version of the robot was video recorded walking in snow. It stumbled and struggled, but it did not lose equilibrium and did not fall down. In a few months, with access to resources, the upgrading was…well, enough to surprise me, and that is not easy. If that is the information provided to the public, go figure. Who knows what technology they have hidden around? This said I would like to recommend, under the experience of our current collapse, some basic, and other perhaps not so basic approaches for not being hit so hard. Going deeper in my concept of minimalist, hi-tech, but at the same time with some low-tech and very functional devices, added to nomadic living, I would do as follows. Jeez, I will do it, indeed. First, my dream home studio where I could relax, listen to some Vivaldi, and have some wine with my wife chatting lightly on a couch, never was anything but a dream. Nor was a place to watch our movies from my hammock, with a good air conditioning either. By having used a few additional resources wisely, my attempt to buy a motorhome would have been successful. Taking with us more of our stuff would have been much easier. A large amount of the equipment that I was going to use for my retirement business is still sitting there in Venezuela. Lots of hard earned cash, sitting still on a dark room. No way to sell it. No one is buying. The uncertainty is too much. We could have gone to my folks’ place, in a sort of “cold” bug out. They have a small plot where we could have parked in the mountains nearby, taking the kid to school down to the town every day, and tried to get some cash online, as much as the power failures and the internet allow it. Perhaps some part-time assisting to my dad at some of the few remaining farms around there. It would have been much easier to find the support of the community where I grew up. Being there it would have been much easier as well to grow some crops, mainly vegetables, and fruits. Clean water, much better than the minerals-filled well water we used to have in our former city and that we had to filter thoroughly. Our motorhome, retrofitted with a good diesel engine, a brand new auto transmission would have served as a secondary place; my folks have a small shack in those mountains, old but perfectly functional. Despite the gov mafia generating all kind of necessities in the town, like propane gas for cooking, electricity, and medicines, in the country these needs were going to be much less. There is not too much firewood, but the building of an apparatus for producing briquettes made by grinding and compacting twigs and other biomass would have been easy. No electric power? No problem. I have a 9 years old guy filled with energy, an old bicycle, and my dad has an old welding machine, diesel powered. LOL. Of course, most of the people in Venezuela are not used to this kind of thinking. And I am sure that this is the reason of so much struggling. A lot of people have trouble adjusting to their new location. I just passed by a local workshop, and they were oxygen cutting some large pipeline pieces, with a large diameter. After a few minutes watching all the time and the incredible hard effort to properly accommodating the part, and the repetitive, accurate and slow positioning process needed, my engineering skills clicked in and I recommended the owner to makeshift a rig with some thick steel plate and a couple of discarded truck or tractor bearings, cutting vertically instead of horizontally over the naked floor. (I should have designed something quickly and charged him for that). These are skills that would be useful to survive, and perhaps people coming from the worker class, with some effort and research will be able to deal with most of what life throws at them. Uptown city dwellers? Well, I don’t know. I am just in the middle, think, and taking a beat, fellows. I am no mocha-latte-from-famous-coffee-shop drinker, but because of my thick European half-blood, I do need good coffee. Remember, if you need some more information about nickel-iron batteries, I can write a basic tutorial. There is plenty of information on the net, though, but it could be interesting to write about it from the survivalist approach. Stay tuned for the part 2 of this article! Thanks for your reading, and special thanks for your much-needed assistance. Stay safe, and God bless us all. 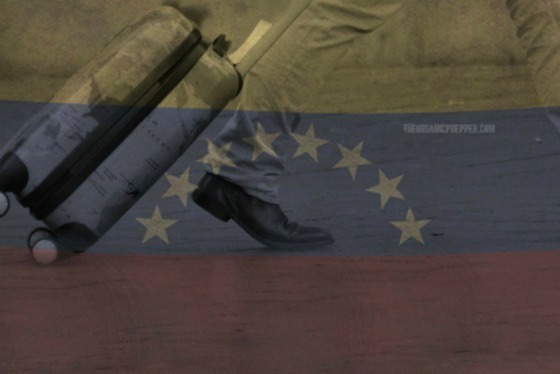 This article was posted in Bug out, bugging out, Economic Collapse, Headline News, nomadic living, nomadic survival, preparedness, prepping, SHTF, survival and tagged Venezuela. Bookmark the permalink. Follow comments with the RSS feed for this post.Comments are closed, but you can leave a trackback: Trackback URL.